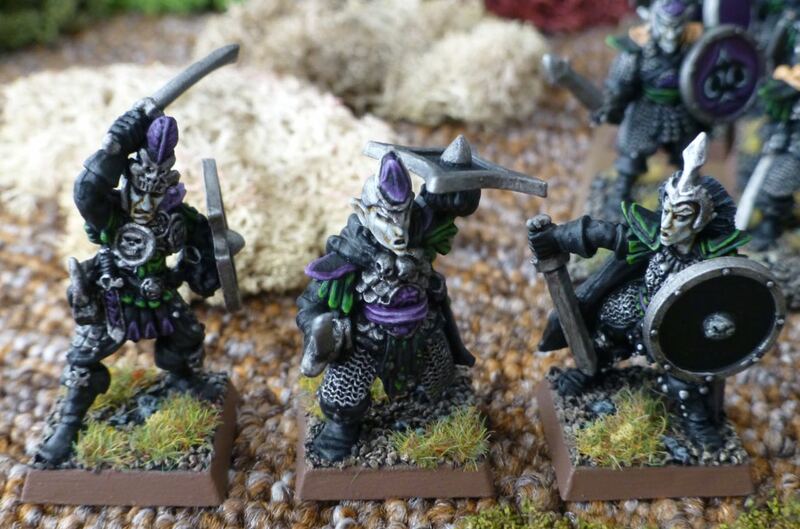 One of the many gradually growing armies in my collection are the Dark Elves for Warhammer 3rd Edition. 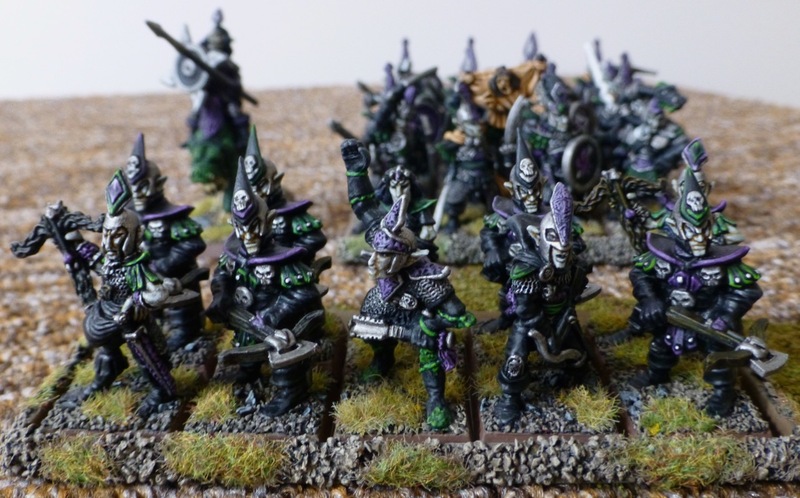 I have the majority of the infantry finished (I am aiming for a modest 1500 points), but was still lacking leadership. 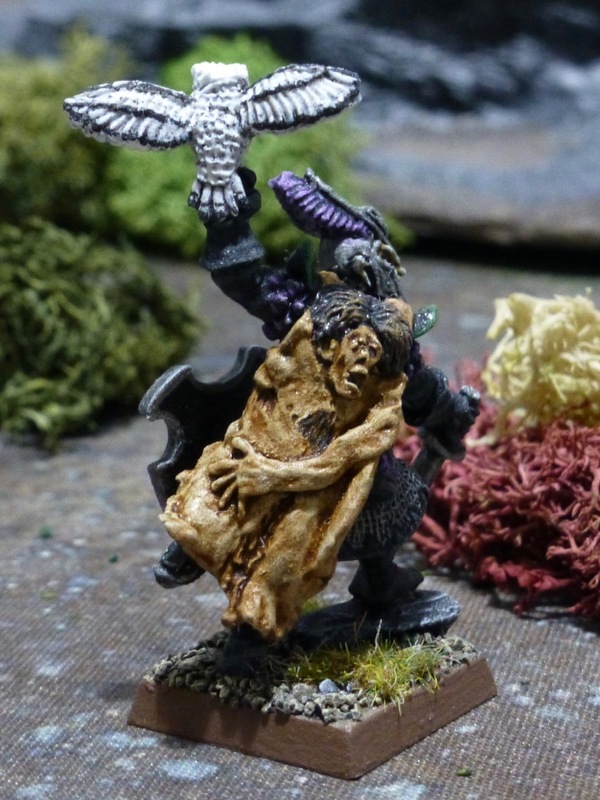 I decided on the Champion from Mengil Manhide’s Regiment of Renown as a level 15 Death Dealer, since I always liked the bird of prey he is carrying. 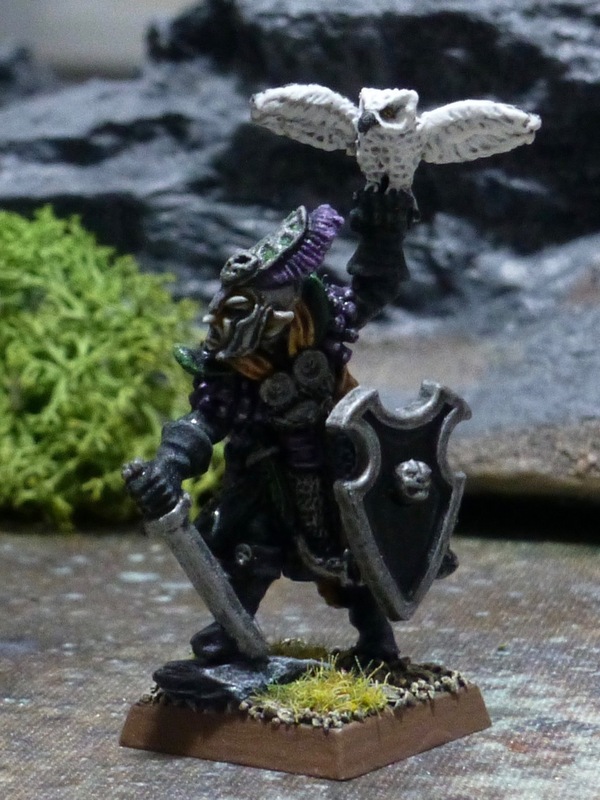 To provide contrast to the largely black troopers in the army and in keeping with my overall colour scheme, I chose the Naggarothi Snowy Owl as the general’s hunting bird. Oh really, your name is Ean Hawklord? 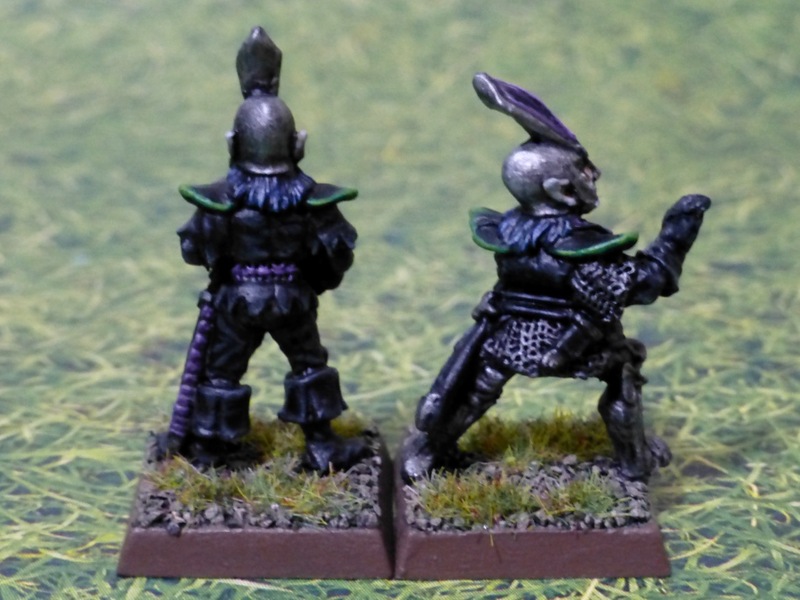 I also replaced the leader of one of my crossbow units, since ironically he had been one of the few Dark Elf figures without a crossbow on him. Now a suitably armed warrior has taken over his duties. 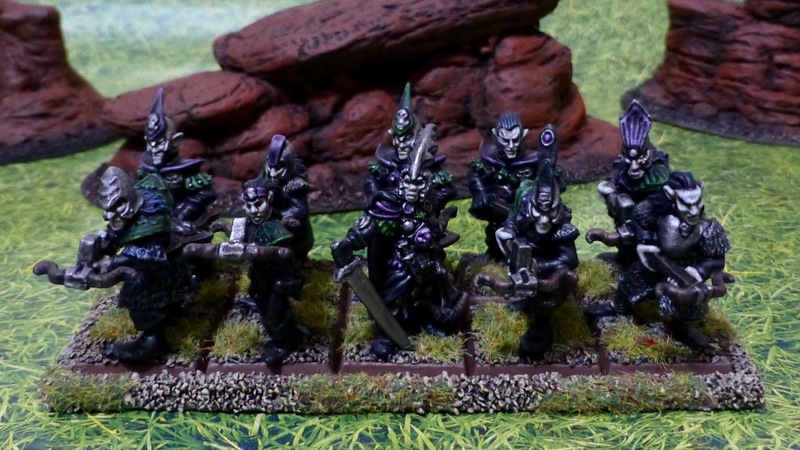 I haven’t worked on my Oldhammer Dark Elf army since the start of the year, so it was time for an update. 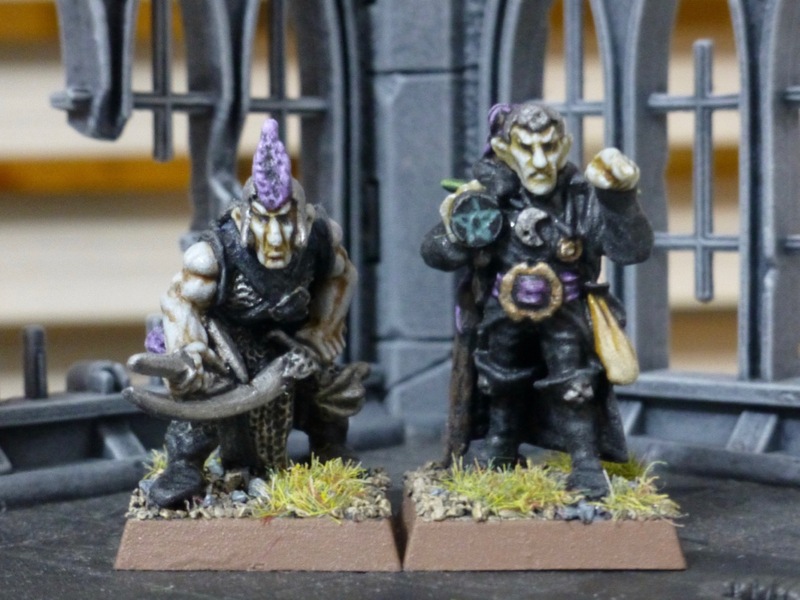 Rather than committing myself to another unit, I finished two of the three character models that I have in the list – an Assassin and a Sorcerer. 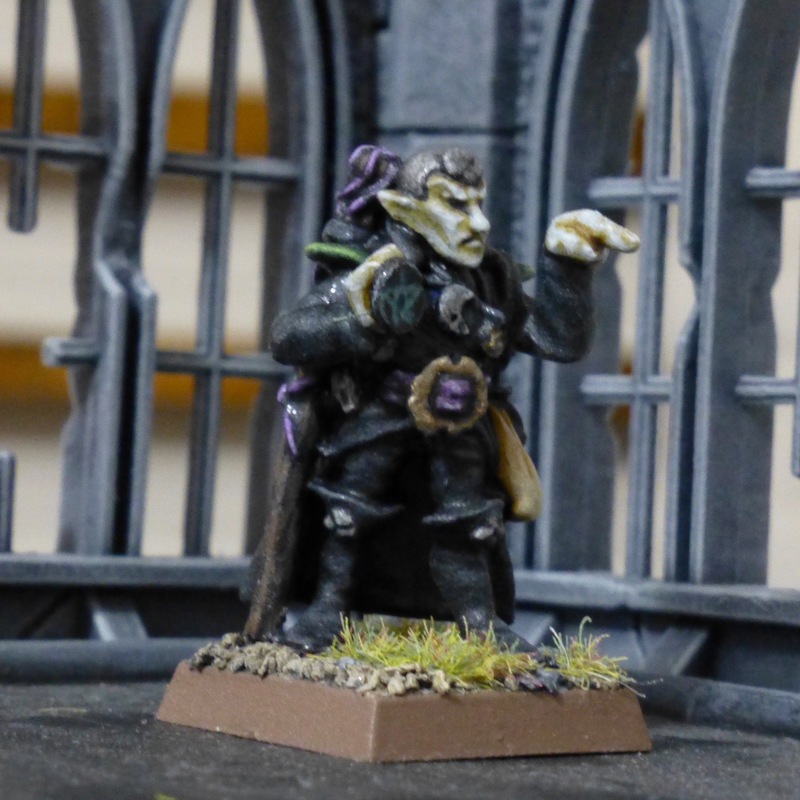 I kept the paint jobs simple and dark as usual, with the only divergence from the standard colours being some bronze on the Sorcerer and a verdigris wash on his magical amulet. 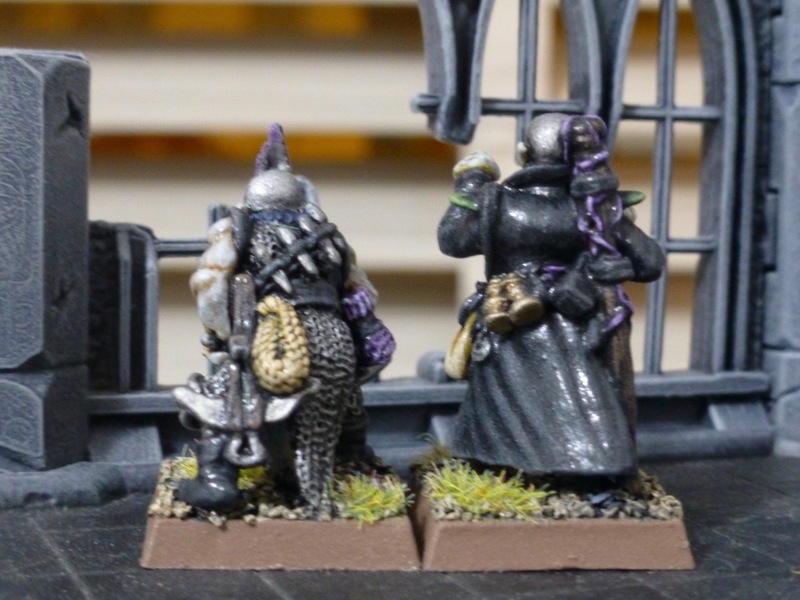 I particularly like the stances of these two that fit their professions very well. 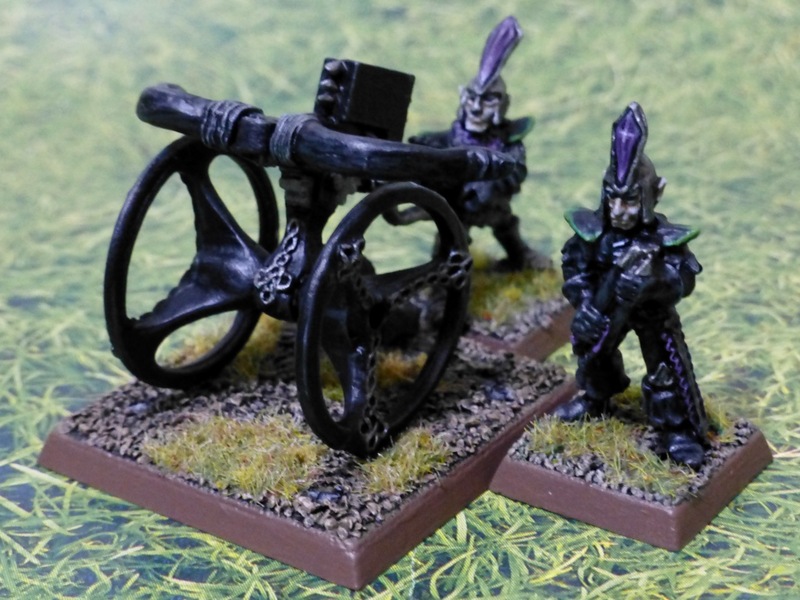 Since I am finishing bolt throwers, here’s another one for my Oldhammer Dark Elves. 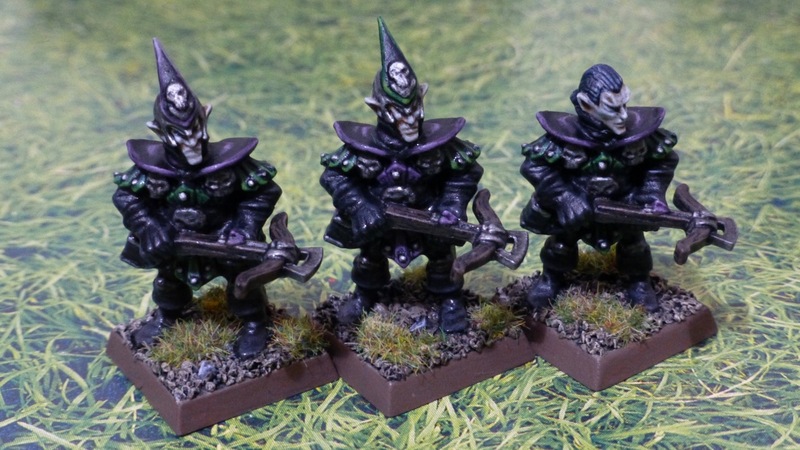 I’m using the Warhammer Armies entry, so painted up just two of the four crew that come with the model. Once I have a second machine, this can then be operated by the other two. 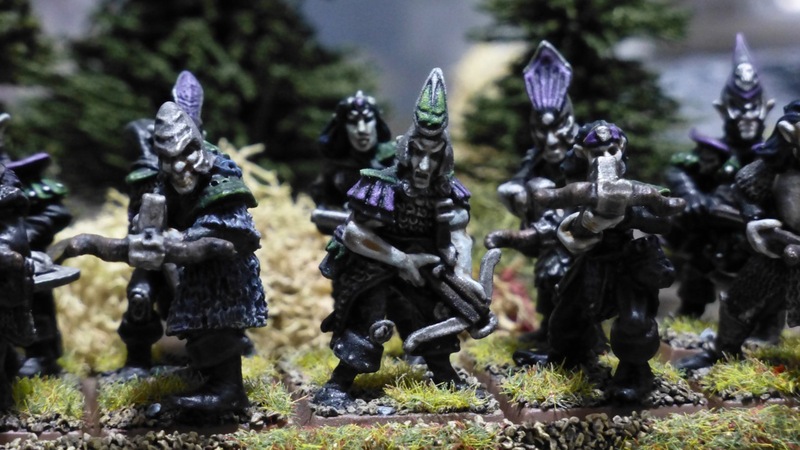 The first detachment of crossbowmen for my Oldhammer Dark Elves is finished. 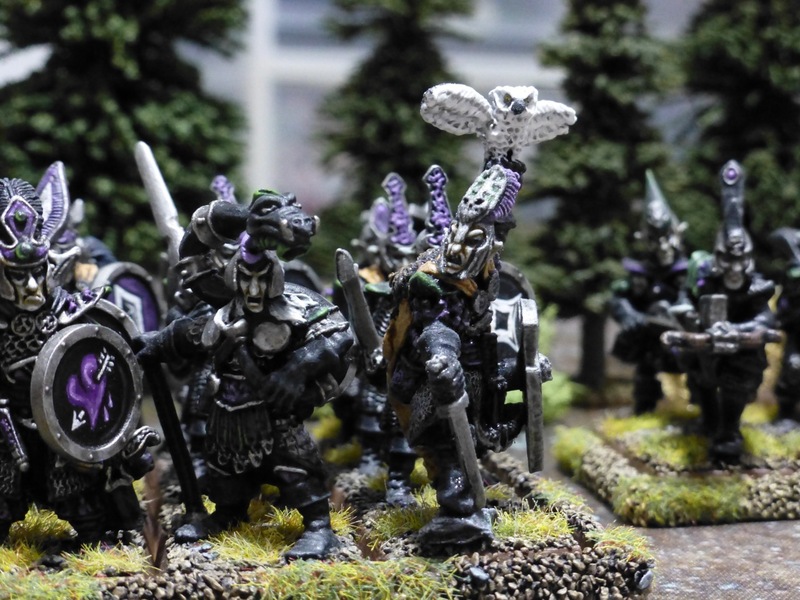 It’s a combination of five metal and five plastic figures from Citadel. 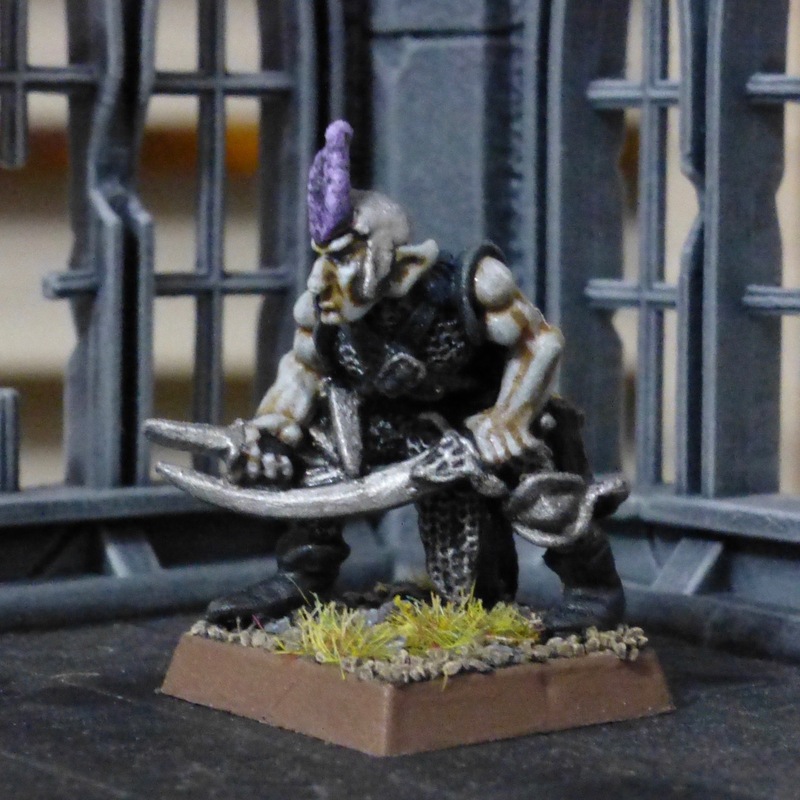 For the second detachment I am mixing the plastics with metal Marauder sculpts. 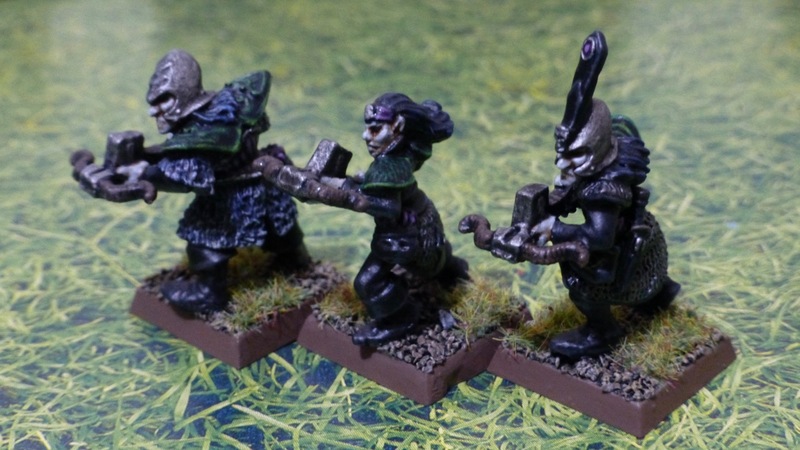 I also completed the first of my Doomdrakes, five Dark Elf knights on Cold Ones. 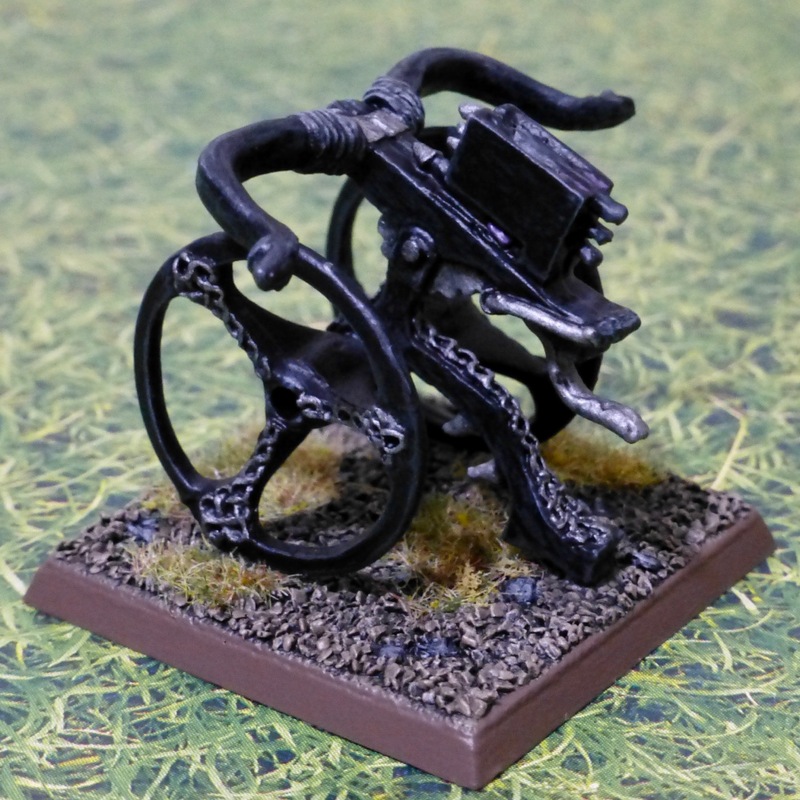 For the mount I went with a classic green scheme which also ties it into the army colours. 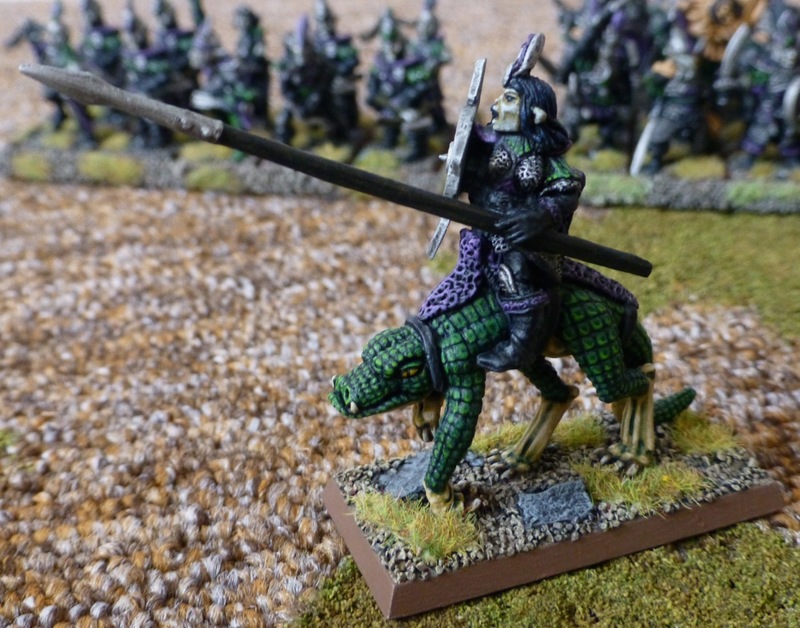 The rider uses the uniform purple, black and iron with green accents. 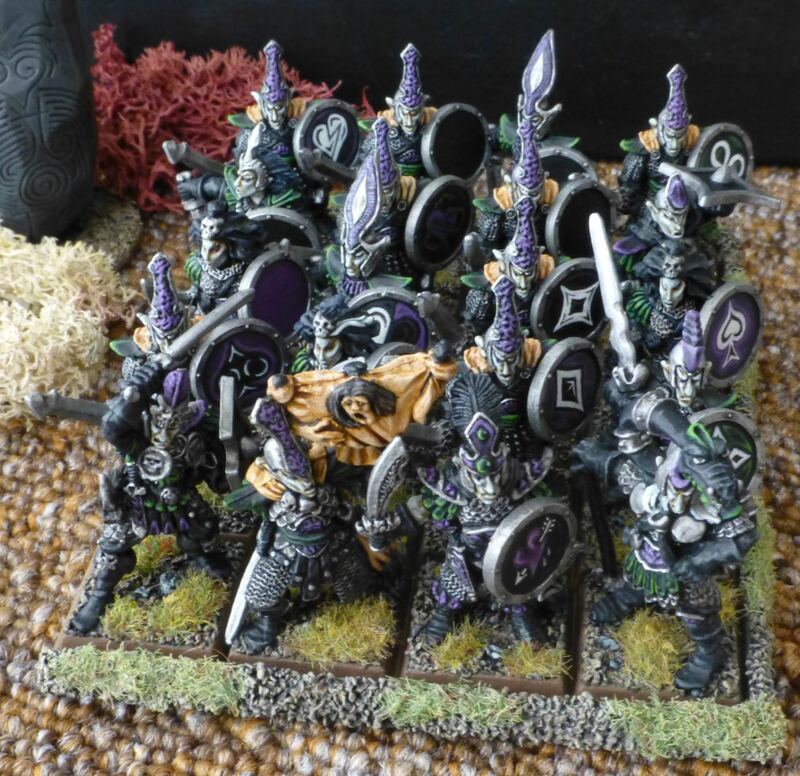 For this unit I want to use the more unusually shaped old shields. I painted this up very basic and will decorate it later once the rest of the unit is finished (probably with some runes in white). 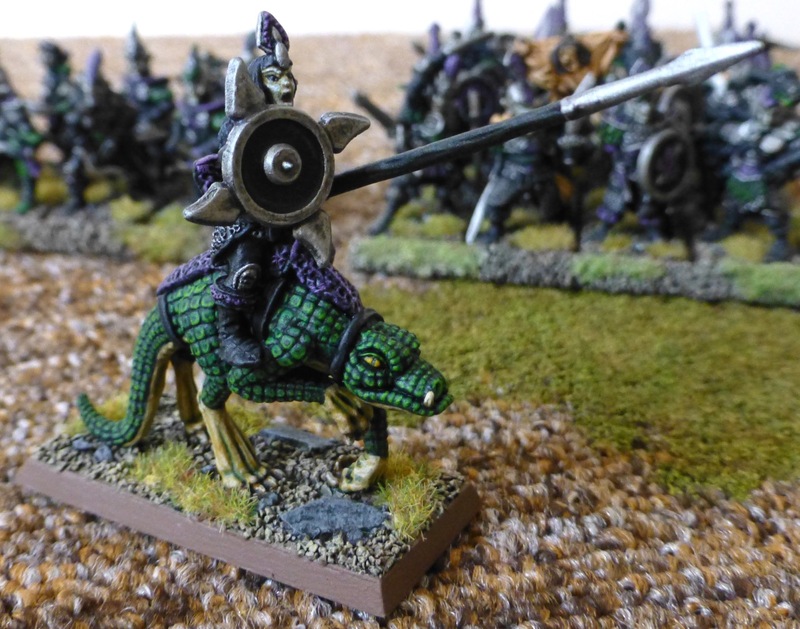 I converted the rider and equipped her with a lance taken from the classic plastic skeleton horsemen. 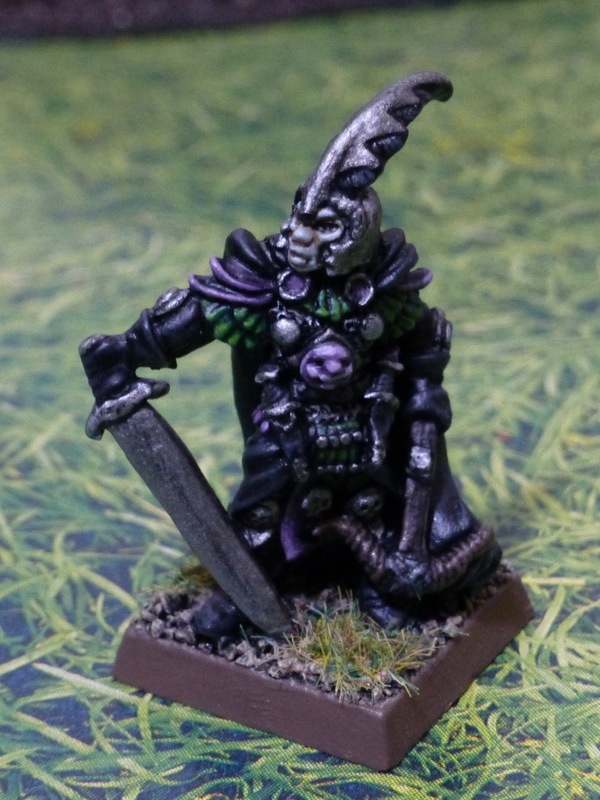 I think the long, slim lance tip fits the Dark Elven style very well. 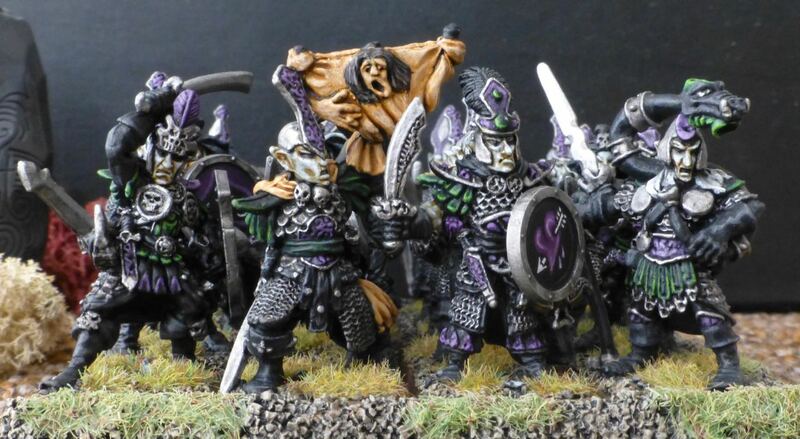 The core regiment of Dark Elf Warriors I started last year has been languishing close to completion for a while as I got distracted by the call of the necromancer. 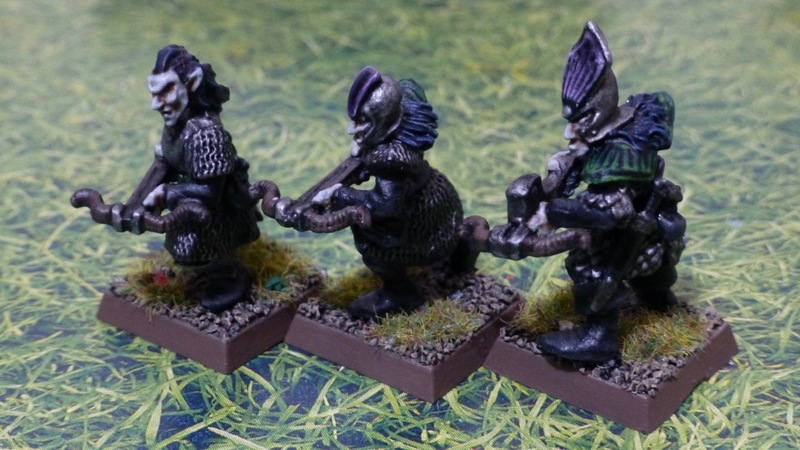 Now I’ve finally managed to paint the last three remaining figures to make a band of twenty. There are a couple of elements I’ll go back to later on in the project before I can call it finished. There are some shields that don’t have emblems yet. 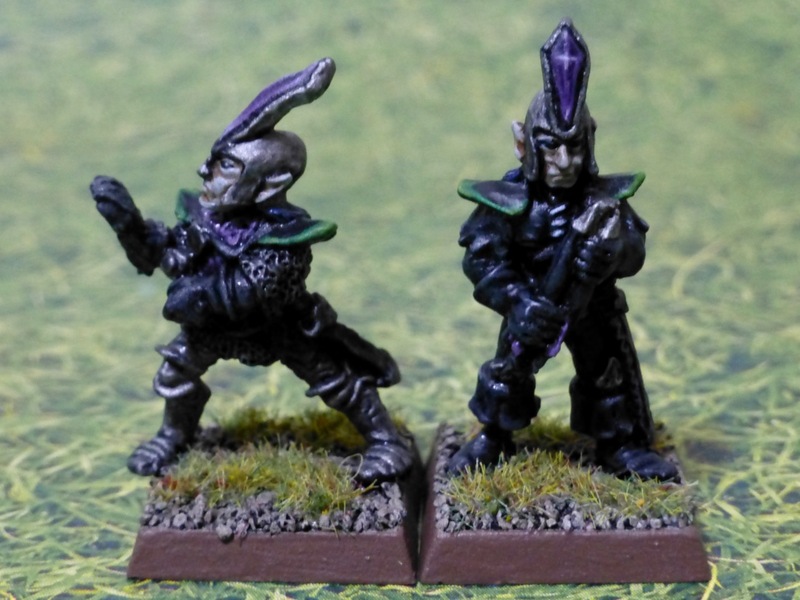 I might rethink the design of the shields altogether and mix in more of the typical Dark Elf shapes that I used for two of the latest additions. I also kept their shield bosses, the one on the right came with the small demonic face that I didn’t want to lose. I still want to find a replacement for the missing banner top as well. I’m waiting for the right flash of inspiration, which will probably come once I start delving a bit into the army’s backstory.